I love the bodiness and sheer ‘physicality’ of relics (lit. remains, often of body parts). “A monk of St. Anthony having been at Jerusalem, saw there several relics, among which were a bit of the finger of the Holy Ghost, as sound and entire as it had ever been; the snout of the seraphim that appeared to St. Francis; one of the nails of a cherubim; one of the ribs of the verbum caro factum (the word made flesh); some rays of the star which appeared to the three kings in the east; a phial of St. Michael’s sweat when he was fighting against the devil; a hem of Joseph’s garment, which he wore when he cleaved wood.”–(tr. via Curiosities of Literature). Apologie pour Herodote (1566, English: The Apology of Herodotus) is a protestant satire of catholicism by French printer and classical scholar Henri Estienne. This entry was posted in Uncategorized and tagged bodily fluids, body parts, relic, sweat on November 30, 2013 by jahsonic. Brutalism at the Schoonselhof. Unidentified grave seen from the back (rear). 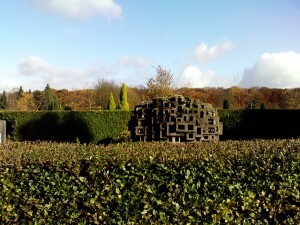 This entry was posted in Uncategorized and tagged brutalism, cemetery photography on November 16, 2013 by jahsonic. “Milestones” by Miles Davis is the 829th entry in my top 1000 songs. There is no hierarchy in this top 1000 list. It’s like a giant mixtape you can put on shuffle. 829 songs (six years in the making; i.e. compiling) account for about fifty hours of music. When finished, the list will feature more than 58 hours of music. The average song length in my calculations is three minutes and a half. This entry was posted in Uncategorized and tagged lists, Miles Davis, music, Western canon, wmc on November 16, 2013 by jahsonic. I’ve been furthering my research on the history of caricature, aided by two books: History of Caricature and Grotesque in Literature and Art (1864) by Thomas Wright and Caricature and Other Comic Art (1877) by James Parton, the two earliest Anglophone studies on the subject. Both mention amusing examples of Roman caricature: the Pygmy caricatures in Pompeii. Neither mentions the Caricature of Innocent XI (1676) by Bernini (above). 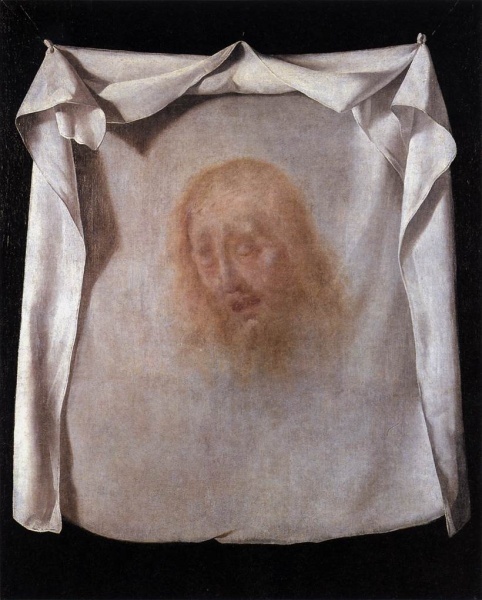 This entry was posted in Uncategorized and tagged Bernini, caricature, Pope on November 11, 2013 by jahsonic. It is with great pleasure that I present an almost complete set of Abbildung des Papsttums (1545, Representation of the Papacy), a series of nine antipapal caricatures by Lucas Cranach the Elder. These woodcuts were published in conjunction with the “Against the Papacy at Rome, Founded by the Devil” a anticlerical and anti-Catholic pamphlet by Martin Luther. The majority of this type of prints during the war between protestants and catholics were produced by protestants, however, there is the fine example of a catholic counter-attack by the depicting ‘Luther as the Devil’s Bagpipes‘. Needless to say, I find this “coarseness” envigorating and I remember how amused I was when I first read “You should not write a book before you have heard an old sow fart,” another infamous dictum by Luther. You can find more at Martin Luther’s anti-Semitic and antipapal pamphlets and protestant satire of catholicism. In case you would like to purchase the set, it will cost €35,000. This entry was posted in Uncategorized and tagged caricature, grotesque, Luther, religion on November 6, 2013 by jahsonic. 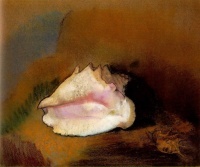 The Shell by Odilon Redon represents yonic symbolism. I found the above dictum while researching sexual symbolism. Ferenczi’s dictum was most famously referenced in Life Against Death: The Psychoanalytical Meaning of History by Norman O. Brown. This entry was posted in Uncategorized and tagged Odilon Redon, shell, symbolism on November 4, 2013 by jahsonic. 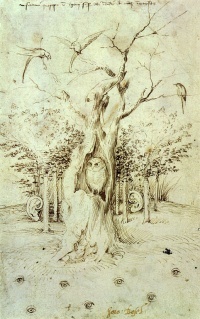 The Trees have Ears and the Field has Eyes is the informal title of a two-sided drawing by Hieronymus Bosch. The disembodied eyes are on the ground, the disembodied ears float in the woods. I previously published an example of disembodied eyes here. See disembodied and independent body parts. This entry was posted in Uncategorized and tagged disembodied, independent body parts, senses on November 2, 2013 by jahsonic. Following my previous post on  the concept of the grotesque body in Bakhtin’s book Rabelais and His World (which mentions the term grotesque 91 times), I did some research on previous books Bakhtin mentions in Rabelais and His World with reference to the grotesque. One of the authors whose name pops up most (13 times) is that of Heinrich Schneegans, author of Geschichte der grotesken Satire (1894). Bakhtin criticizes Schneegans for failing to notice the connection between caricatures of the human nose (above) and the phallic symbolism of the human nose. Sometimes a nose it not a nose. This entry was posted in Uncategorized and tagged grotesque, human nose, humor, phallus, symbolism, theory on November 2, 2013 by jahsonic.